From Nursery, where students begin the process of fundamental skill development in a fun, yet challenging environment, to the Sixth Form who represent the school at local, national and international level sport is an integral part of school life at BST. Lessons are taught by experienced, fully committed specialist staff, who share the same philosophy of installing a lifelong love of sport and physical activity in their students. It is the goal of the PE department that all students make progress and are given the chance to experience a range of opportunities both within and beyond the curriculum. All students are encouraged to display teamwork, respect and a positive attitude towards PE and Sport. Students learn to win, and lose, gracefully, and are given the tools to reflect upon and evaluate their own and others performances. This understanding is further developed through students fulfilling a variety of roles to enhance their leadership capabilities. Across all Key Stages, students at BST are given the chance to take on positions of responsibility such as: Coach, official, leader, choreographer, organiser, reporter, photographer, Sports Captain and the prestigious Sports Ambassadors’ role. Each Year group sees progress that exceeds National standards, allowing all students to go beyond their academic and sporting potential, culminating in outstanding results at iGCSE and A Level. Through a variety of teaching and learning techniques, students are given the necessary skills to become independent learners and use modern technology to gain even greater success. Extra-curricular clubs play a huge part in a student’s life at BST. We offer a diverse range of activities with training before, during and after school, helping to maximize participation from students at all levels. BST has an exceptional sporting reputation within the international community in Japan, competing in numerous fixtures and tournaments throughout the sporting seasons. BST has a strong swimming program encompassing the whole school from Reception up to A-level students. We compete against a number of local International and Japanese schools and aim to tour overseas at least once a year. In our younger years program there is focus on water confidence and the basic technique required in Front crawl, Backstroke and Breaststroke whilst maintaining the ‘fun’ aspect of learning. Our squad programs in Primary, Middle School and High School focus on the competitive edge with a major emphasis on technique, stamina and speed. Training sessions are scheduled every day. Our major competitions include the ISTAA event which we won last year and the KANTO plains meets which we are currently placed second. Gala selection is based on qualifying times and there are opportunities available for all levels to be selected for events which may include Kanto plains, sprint galas, inter-house events, local meets and time trial galas. Thirteen BST swimmers participated in the secondary swim meet at ASIJ on Saturday 26th January. They competed against other four international schools and three Japanese schools. Seventeen BST swimmers who are all 11 years old and under participated in the swim meet on Saturday 3rd November at the American School in Japan. Twenty two teams, including ten teams from Philippines, Beijing and Taipei participated in the St. Mary’s swim meet on Saturday 13th and Sunday 14th October. There were thirty seven BST swimmers who all swam superbly over the weekend. On Saturday 22nd September we had our first swim meet of the academic year. Thirty four BST swimmers competed at St. Mary’s International School. St. Mary’s hosted the last swim meet of the year. 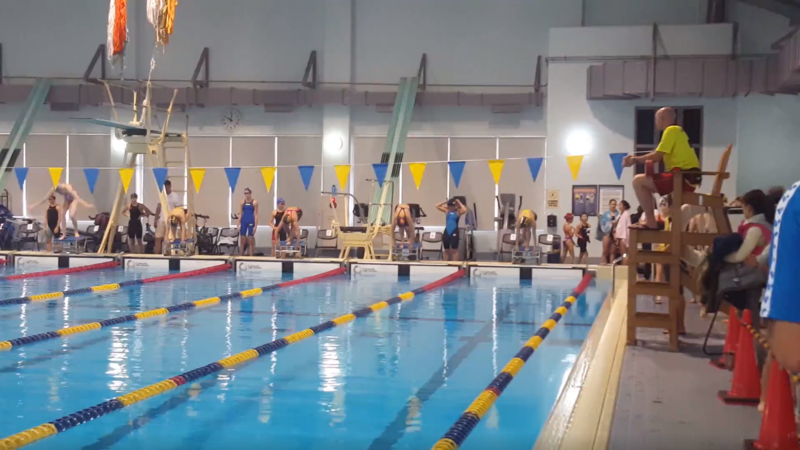 There were two hundred and seventy five swimmers participating from fourteen teams. Huge congratulations to Leo (8) who broke four BST school records and achieved the highest point score in his age group. He swam 50m across all four strokes, breaking his PB’s in each event. Last weekend was a big two day meet at St Mary’s School with 25 teams participating. This included teams from overseas, with over 500 swimmers taking part. BST had of squad of 40 swimmers attending over both days, competing in many different races. It was impressive to see some of our swimmers participating in three individual events and two relays over the weekend. Great job! It was our first swim meet of 2018. 30 BST swimmers worked hard to beat their PBs. For some swimmers, trips to Hakuba and Norikura meant they had to overcome some extra tiredness from being away skiing all week but then still swam hard and tried their best. Good work! Our last meet in 2017 was at ASIJ with 5 other schools. It was the last swim meet for James (14) as a BST swimmer. He has represented the BST swim team for many years and has supported his teammates and always trained extremely hard. We know he enjoyed competing for BST very much and also broke his own school record by 0.4 second in his 50m Freestyle. James produced another exciting race and achieved first place in his favourite event, 100m Backstroke. Well done and Good luck with your swimming career in the future! We will all miss you. 200 swimmers from 8 swim teams joined this meet and swam hard to beat their PBs. It was a long day at the long course pool but we all had a great experience. 14 swim teams participated and more than 300 swimmers were at the meet. Our team had 30 swimmers, swam very hard to beat their PBs. We signed up to 117 individual events and 14 relays. The meet was very long but they all tried hard till the end of the day. Our team of 25 swimmers had some great experiences at the meet. We signed up to 55 individual events and 10 relays. We have 3 more swim meets to go in 2017. Let’s swim hard!! - 18th Nov. Orcas swim meet at ASIJ - 3rd Dec. Snowflakes invitational at Yokosuka - 9th Dec. MS & HS combined meet at ASIJ. We had 32 swimmers swim at St. Mary’s on the weekend right before the half term break. There were 144 individual events and 12 relay teams. The meet was really big with 9 strong swim teams from overseas. We had 53 swimmers who bravely swam at this meet. We had 178 individual events and 6 relays and lots of medals and ribbons were won. Hockey at BST is delivered in the curriculum throughout all year groups to both boys and girls. This allows the students to be taught a number of skills and principles of the game and give them a taste of what the sport is about. We also offer Hockey as an extracurricular activity from Year 4 through to Year 9. This is a chance for students to further improve their skills and game based knowledge. In the high school (Year 10,11,12, 13) we enter the Varsity Kanto plains tournament and play competitive fixtures during Term 2. We have a squad of 16 players who train twice a week during the competitive season. Hockey at BST is a popular sport and has really developed over the past few years. Both boys and girls start playing football in Year 3 and play more games progressively throughout the Primary years. These fixtures culminate in ISTAA Tournaments and beyond. The main Primary football seasons are term 1 and 2, when the majority of games take place. A real emphasis is placed on technique, creativity and teamwork, hoping to ensure that all students are comfortable on the ball. Football has two simple aims; to get everyone involved, no matter what their skill level, and for everyone to make progress and enjoy the sport. We are currently the International Schools in Tokyo Champions in Under 10's and U12's Football! Football is a very popular sport at BST and is played in Secondary by both the middle school and high school boys. Both age groups compete in the Kanto Plains football competition against a number of large international schools in and around Tokyo. The seasons run from September to November for the middle school and December to February for the high school. Both completions finish with an end of season seeded tournament to decide the overall winner. The boys will train 3-4 mornings a week focusing on fitness, fundamental skill development and tactics and strategies needed in the game situation. At middle school level we run a successful A and B team program which provides an opportunity to maximize participation. Training sessions are complemented by offering football within the core curriculum in conjunction with the playing season. Our ethos at BST is to develop a lifelong love of football and provide our students with the resources and opportunities to become better technical players and be able to evaluate their performance in order to seek future improvement. With the changing of the season, comes the changing of the ball! Rugby kicks off in January, and ends with a collision at the excellent Kamakura Rugby Festival. The BST rugby club is made up of boys and girls from Years 4- 6. They focus first on ball handling skills before putting these skills to work in tag/ touch games that focus on moving the ball quickly and supporting their team mates. The force that holds the club together is ‘The Team’; supporting everyone, working hard, and not forgetting to pass backwards! Girls and Boys volleyball is played at both high school and middle school during term 1. Middle and High school girls compete in the Kanto Plains league and tournament against other international schools in Tokyo, training three times a week with fixtures at the end weekend. The boys and also the girls compete in the ISTAA volleyball championships at middle and high school level. The middle girls’ volleyball team has successfully won this championship two years in a row. Training sessions give the students’ time to practice and master their skills and develop their game play. Volleyball is a popular sport at BST especially during the first term, the students thoroughly enjoy it. Basketball starts with a vengeance in term 2, when the majority of games are played, and ends the with BST hosted ISTAA Championships. The players work on individual skills and how these can complement the team as a whole. The sport itself requires a high level of fitness as it’s always end to end and the ethos of pass and move is always encouraged. Basketball is a sport played competitively by both boys and girls in Secondary at BST. In the middle school the boys play both ISTAA and Kanto Plains level basketball. The school fields an A and B team, with training taking place three mornings a week and regular fixtures on Saturdays throughout the season. Basketball also features in the core PE curriculum and is used to enthuse students and give them the fundamental skills to play the sport as an extra-curricular activity. Basketball continues to be a popular sport and students enjoy the opportunity to represent their house in the annual Secondary inter house competition at the end of term two. Basketball in the high school is still very much a developing sport. The school hires in two specialist coaches to train both the high school girls and boys teams and for the last few seasons they have competed in the ISTAA basketball competition. This subject covers a broad range of activities, from the delights of cross country in autumn, through to Sports Day and athletic meets in term 3. From Key Stage 1 up to Key Stage 5 every student is asked to challenge themselves to improve times and distances, working more on technique the further up the school they go. Many Year groups have Running Clubs that occur during the day and lots of students train outside school with their parents. Run for life! Currently at BST athletics is predominantly a curriculum based activity which the students enjoy participating in during term three. Students have an opportunity to develop technique and confidence in a range of track and field events aiming to achieve personal best times, heights and distances. The big Secondary whole school event is the annual Secondary school sports day at the end of term one. This is a fantastic all day activity where all students are encouraged to represent their house in both track and field events. Students always look exceptionally smart in their house colours and enjoy the competiveness of the event and the opportunity to win a medal. During term one the school also competes at the ISTAA cross country championships. At BST, running is an exceptionally popular extra-curricular activity providing students with an all year round opportunity to develop fitness and try a new sport. In 2014/15 BST plans to enter the Kanto Plains cross country competition and host a number of triangular athletic events in partnership with many of the local ISTAA schools. Term 3 sees the start of cricket in the Primary curriculum, and from early years we focus on fielding skills and timing when batting. As the students mature a greater emphasis is placed on technique, with skills such as bowling and batting at the forefront. Matches are played against a number of other club sides and BST hosts several coaching/ match days. Cricket in BST Secondary runs at both the U12 and the U17 level. We currently participate in Home and Away series’ against Chiba My-Ys, Gunma, Sano and the Indian School. All of these teams have a long track-record in cricket and are able to play at our level. Most games take the format of 12 or 20 over games, with usually two games in each fixture, and often the U12 and U17 games taking place simultaneously. The main season runs from September to December to coincide with the reliable weather of the Japanese Autumn. There is also a Summer season from April to June. Fixtures are on a Sunday, to accomodate the Japanese school timetable, and home fixtures run with a Mid-day two hour training session, followed by the games. Given the excellent home facilities we usually play under floodlights until 7.00pm, which allows for a full game experience. In the main season there would be an expectation of 8 Sunday fixtures in the term, so the time commitment is considerable. The training sessions involves Fielding and Net practice. The Seminar Field location allows us to set up nets and catching practice so that they can run at the same time, and we have all the equipment necessary to allow cricket practice to take place with full protection for up to 22 players. On the Showa site we use Incrediballs, a cricket ball substitute which behaves like a cricket ball for most purposes but which does not have the same effect should it hit a window. High and middle school boys and girls participate in competitive futsal at BST and is a well attended ECA. The Girls middle school team plays in two futsal leagues, firstly in the Kanto Plains futsal season throughout December to February where a number of teams from International school come together on Saturday to play. Due to this the middle school girls training sessions run from November to February half term. Futsal resumes during term three for both the middle and high school boys and girls competing in the ISTAA futsal championships, playing a number of games against other schools during term 3 with a final end of season tournament in June. Netball starts in term 1 and is a very popular choice for girls and boys. It is quite possibly one of the best of team sports, as everyone is reliant on each other. The focus begins with ball skills and learning the footwork rule, then progresses to passing and moving with pace while learning where the play zones. As the season progresses matches are played against other schools, before a tournament draws the season to a close. Netball is a popular sport at BST amongst the middle and high school girls. Netball is a sport that is commonly played and studied in British schools and many of those joining BST already have a good set of skills that they can continue to develop and bring to our school team. There are a limited number of other teams to play against in Tokyo; however this does not deter our girls from regularly training and enjoying participating in netball.